Find out what our experts have to say about Hero Passion Pro! The least priced variant is Hero Passion Pro i3S AW DRUM priced at Rs. 63,851 and the most priced variant is Hero Passion Pro i3S AW DISC priced at Rs. 65,999. Choose the Hero Passion Pro which fits the bill of you. Keeping the magic formula of basic design the same, Hero has made some subtle changes to this refreshed model. Though the new bike looks similar to the Passion Pro 110, if you look closely, there are certain differences you might notice. On the front end both get the same headlight with black visor, but on the Passion Pro is much sleeker. Both get the body-coloured mirrors, but mirrors on the Passion Pro gets a more chiselled look. The Passion Pro still retains the simple tank design, unlike the Passion Pro 110, which has a beefier tank. Unlike the Passion Pro 110, there is one side panel that goes from the centre of the Passion Pro to the end, which lends the bike a much sleeker look. Black grab bars on the rear of Passion Pro adds to the style element, while the new rear tail light design looks more attractive when lit up. The seat is thicker and comfortable on the Passion Pro as compared to its elder sibling. The instrument cluster on both the bikes is the same one with an analogue speedometer and a digital console with the readouts including odometer, trip meter, service reminder, and a fuel gauge. The engine is what sets apart the newly launched Passion Pro with the Passion Pro 110. 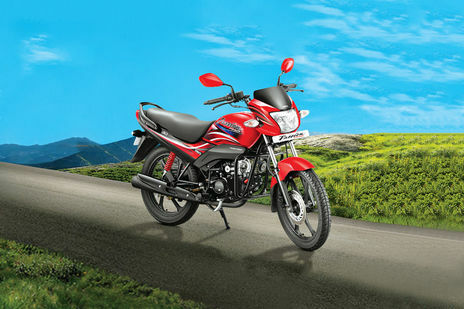 Hero Passion Pro, unlike the Passion Pro 110, runs on 97.2 cc air-cooled, 4-stroke, single-cylinder engine. This engine belts out a decent max power of 8.36 PS at 8000rpm and a peak torque of 8.05 Nm at 5000rpm. The engine now has the famed i3S technology and is mated to a 4-speed gearbox. Owing to the refined and the smooth but robust gearbox, ride on this commuter is very comfortable. This is one of the best commuter bikes available for the masses and is now better by Hero’s i3S Technology which helps deliver an amazing mileage of 84kmpl. Top speed of this bike is at 87kmph and tank capacity is more than Passion Pro 110 at 12.5 litres. Unlike the Hero Passion Pro 110, the Passion Pro is available in both spoked as well as alloy wheels of 18-inches. These wheels are covered in 2.75 x 18 - 4 PR / 42 P section tyre at the front and 3.00 x 18 - 6 PR / 52 P section tyre at the rear which is very grippy. Suspension duties on both bikes are the same including telescopic hydraulic shock absorbers at the front and a rear swing arm with 5-step adjustable hydraulic shock absorbers. This suspension setup works well on all type of road conditions and keeps the rider comfortable. Braking power is commanded by a 130mm drum brake at the rear, but at the front, you have the option to go for a 240mm which will increase your braking ability or you can stick to the standard 130mm drum brake. Riding posture is upright and very comfortable as a commuter bike should be. Stylish headlight on the Hero Passion Pro now comes with the Always Headlight On (AHO) feature. This safety feature ensures that the bike is visible to the oncoming vehicles on the road, in any weather conditions. Another safety feature on this commuter bike is the optional Disc brake that has a good feedback and comes in handy in those emergency braking situations. Now the new Passion Pro also features Hero’s acclaimed i3S Technology that helps save fuel. The way this works is the i3S or Idle Stop-Start System turns off the engine at a traffic signal and starts it as soon as you press the clutch, thus preventing idling of engine when not needed and thereby improving mileage.